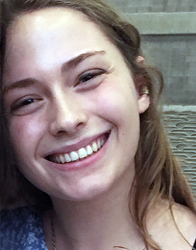 Maya London-Southern was a 2017 Green Writers Press summer intern and is currently a student at Middlebury College. Lauren Singer is such a person. She is at the forefront of the Zero Waste movement, and can fit all the trash she’s produced in the past four years in a 16oz mason jar. She is the author of the blog Trash is for Tossers. In 2014, she founded The Simply Co, which makes sustainable and toxin-free laundry detergent, and this past May, she and Daniel Silverstein opened a pop-up store called Package Free in Brooklyn. I first heard of the Zero Waste movement in passing, but didn’t pay much attention to it until I saw a New York Times interview with Singer in January 2017. I was attracted to the way the lifestyle massively simplified her life, and I realized that what she was doing actually aligned with my desire to live minimally. The sustainability aspect was a plus in that. 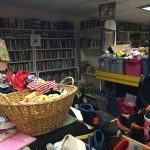 As I read more of her and Bea Johnson’s (a woman living a Zero Waste lifestyle with her family of four, and author of the book and blog Zero Waste Home) blog posts and watched each of their how-to videos, I realized that if I lived this lifestyle (or even just adopted aspects of it), I would declutter my life and save money, all while reducing what I send to landfill. It would need some adjusting to, but I saw the massive benefits to be well worth any growing pains. I started with the basics, which was really just a consciousness of what waste I produced every day and an understanding of what could actually be reused, composted or recycled. The simplest change was always bringing a reusable bag with me when I went shopping. A lot of people already know about this sustainable alternative, but by making myself commit to refusing any plastic or paper bags, I saved resources, resources that if I had used would have either sat around in my room or I would have just used for trash (but in not producing trash, you don’t have a need for the plastic to dispose of it either). I would also sometimes throw out banana peels and apple cores when I wasn’t near a compost bin on my college campus, but over 25% of all food the US produces for domestic sale already ends up in landfill. What’s more, when food waste is in landfill and unable to compost, it generates methane, which traps heat within the atmosphere. And according to the U.S. Environmental Protection Agency, landfills make up 34 percent of all methane emissions in the country. When possible, the best option is to eat or use your food scraps for something else. This saves the energy that would otherwise be used to grow and transport new food products. For example, you can make water infusions with citrus peels (more resourceful ideas to come in later blog posts). But if nothing else, please please compost your food waste. Producing more soil instead of more landfill and methane was something I had to learn, but it’s actually a very easy transition. Through Trash is for Tossers, I also learned that there are some easy swaps I could make. Instead of plastic toothbrushes (between 850 million and a billion of which end up in landfill each year in the US alone), there are toothbrushes made of bamboo, which are compostable (except for the bristles, which can be removed and recycled) and packaged in recyclable and/or biodegradable products. Singer recommends Brush with Bamboo. When you’re done with the toothbrush, you can also upcycle it for cleaning, art crafts, or plant markers (I upcycled my first one to use as a bottle cleaner). I made these changes over the school year, but I decided that I really wanted to try to go completely (or as much as possible) Zero Waste this summer. 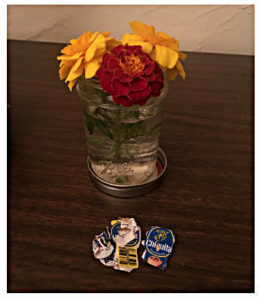 I started on June 1, and so far the only waste I’ve produced are a few fruit stickers, which I keep in my designated summer garbage jar. Dede Cummings recently gave me marigolds from her garden, so I emptied my trash jar to use as a temporary vase (it looks much nicer filled with fresh flowers than with trash). I will talk more about what I’ve done to avoid producing trash in future posts, in the meantime, check out Trash is for Tossers and Zero Waste Home. 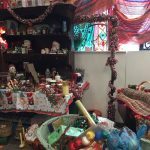 I hope my own blog can be a way to get the word out about Zero Waste and encourage more people to adjust their lifestyles. Not everyone has to go completely Zero Waste in order to make a difference, but there are a lot of small changes anyone can make that will not only be better for the planet, but also get rid of unnecessary clutter in your life, save money, and be better for your health. 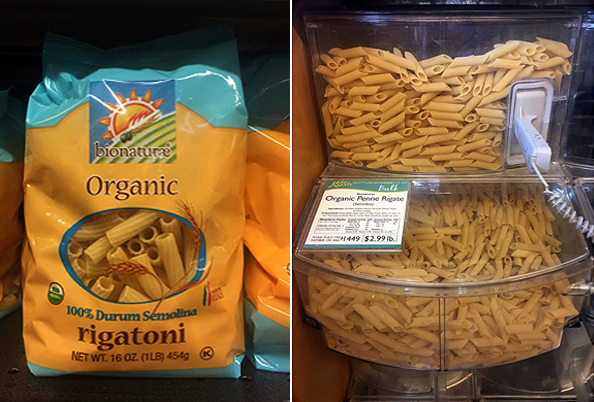 Packaged pasta (the bag will end up in landfill) vs. bulk pasta at the Brattleboro Food Co-op. A tower of jars filled with chili spice, chickpeas, and olive oil, all of which I bought in bulk. The perfect container for so many things, especially liquids—it can even be a to-go cup for cold drinks. If you plan to use a jar for liquid, it’s not a bad idea to test to make sure it won’t leak—Mason jars have always been reliable for me in this regard. When using it for bulk, weigh the empty jar and lid (called collecting the tare or unladen weight). Write the tare on the lid or type it in your phone—you can type the PLU (product look-up) number into your phone as well. This way, you can tell the cashier the weight to subtract from the total weight of both the jar and the bulk product in it, so you won’t be overcharged. I love using jars because they’re easy to clean and easy to unpack—I just move the jar from my shopping bag into my pantry. Jars are easy to access as well. Many grocery stores sell empty ones, but you might already have a few in your house already, they’re just filled with food. Once they’re empty, hold on to them rather than tossing them in the recycling (you can scrub the stickers off with white vinegar or olive oil). Jars are great, but sometimes it’s easier to bring lighter, more compact containers. Reusable cloth bags are perfect for this. Some grocery stores sell them, but you can also make your own using old pillowcases. I cannot stress how simple this is. As long as you have access to a sewing machine and know the absolute basics on how to use it, you can do this. Believe me, I CANNOT SEW and I did a sufficient job. To make it, you will need a pillowcase, a safety pin, and either ribbon or string. I’m writing my own instructions that I adapted from http://sewdelicious.com.au/2012/02/pillowcase-to-drawstring-bag-tutorial.html. Think about how big you want the bag to be and cut accordingly. When cut into fourths, a standard pillowcase will make four bags that are a great size for bulk shopping. Sew the cut sides so that three of the four sides are sewn, but leave a slit (about an inch or two long) unsewn at the top of one of the sides near the opening. Fold the top of the opening the length of the slit over itself and stitch all the way to create the casing for the string. Pin the safety pin to the string or ribbon. Pull it through the bag’s casing. Once the pin is out of the other end of the casing, determine how long you want the drawstring to be and cut the string or ribbon accordingly. Grocery and health food stores range in the amount of bulk they carry. 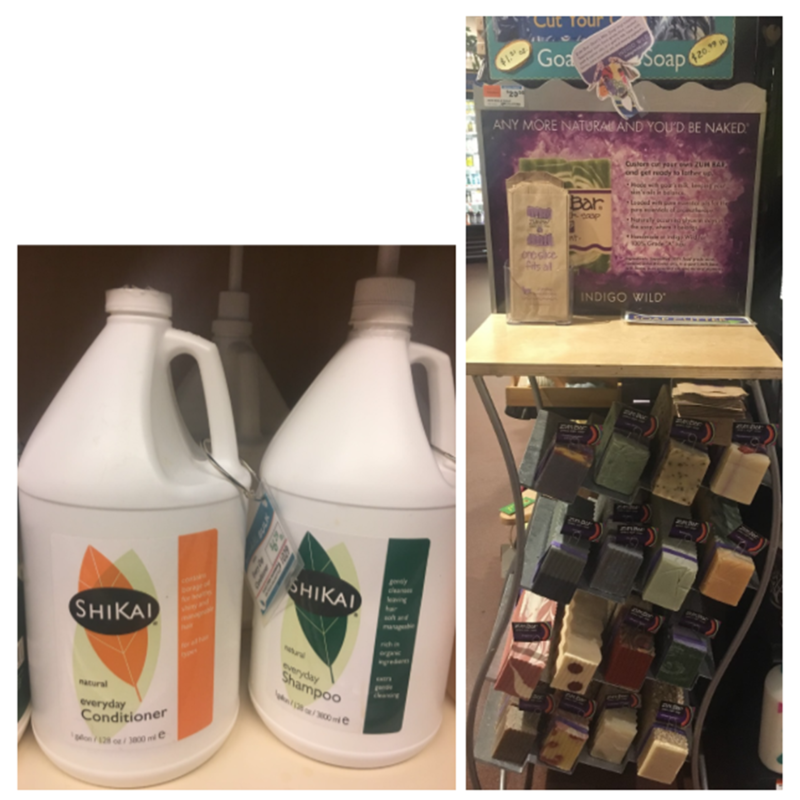 It wasn’t until I was actively trying to only shop in bulk that I realized my food co-op in Middlebury, VT had oil and liquid soap in bulk. The Brattleboro Food Co-op has an even wider selection: along with all the food, there are soaps, oils, shampoos, vinegars, honey, nut butters galore—there’s even beer on tap in refillable growlers and soap bars for you to cut for yourself. Now that I’m regularly shopping in bulk, I can’t imagine going back to buying packaged products. I have so much fun filling my jars and bags, and I’ve saved a lot of money because it’s cheaper (not to mention I can no longer buy those packaged snacks or drinks I used to impulsively grab off the shelves). I honestly love bulk, and I love knowing that I’m not bringing any new garbage into my house that would eventually end up in a landfill. Not to mention, I’m avoiding unhealthy food, because that usually only comes in packaging. Altogether, I feel so much healthier, thriftier and better organized. I cannot recommend bulk shopping enough! 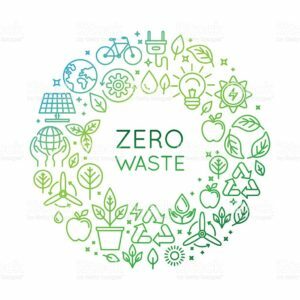 A common misconception is that the Zero Waste lifestyle is more expensive to maintain than one where a person is not consciously avoiding trash. It’s easy to think that, in part because organic health food stores are pricier than regular grocery stores. However, living Zero Waste actually cuts down on expenses. Shopping in bulk, as I’ve already discussed, is cheaper than buying packaged food because it eliminates packaging premiums. And by using reusable products, you don’t have to repeatedly purchase single-use items; while a reusable product may be more expensive, the cost of continually buying the single-use product adds up to make it the pricier of the two. Making your own products using ingredients bought in bulk is also a huge saver. In this blog post, I’ll go over some money-saving Zero Waste alternatives. Please remember to use up, recycle, give away, donate, or sell your old products as opposed to throwing them away. 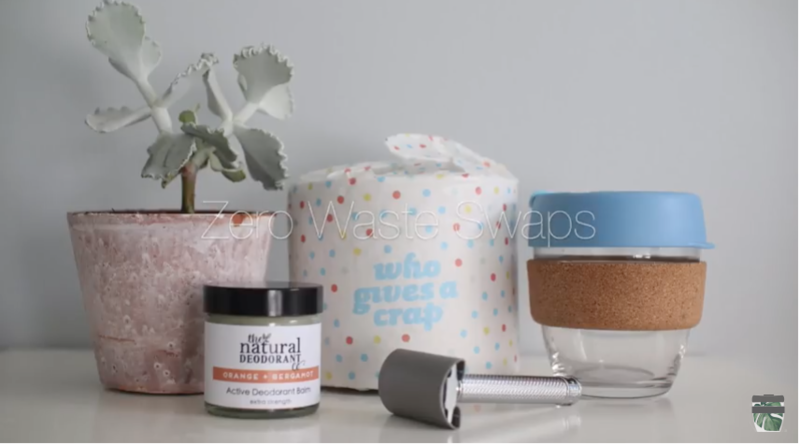 The purpose of this is to prevent less waste from going to landfill, so even if you’re switching to a Zero Waste alternative, you’d be producing waste by throwing out an unused product. Photo used with permission from lifewithoutplastic.com. Instead of using plastic straws, which are usually single-use, make the drink taste worse, and aren’t good for you (the plastic has harmful chemicals that can reach your bloodstream when you ingest the liquid), make the switch to reusable. Also try to refuse plastic straws as much as you can; people working at coffee shops, bars, etc are used to just putting a straw in your drink so try to catch them right away and politely ask to have your drink without one. Aside from metal, there are also bamboo and glass straws. Cleaning is simple, and only requires a specific brush, which sometimes comes with straw sets (all available at https://www.lifewithoutplastic.com/store/drinking/straws.html but check your local health food or grocery store). Photo used with permission from Juniperseed Mercantile. I used to use makeup sponges for my sunscreen powder every day and cotton balls to clean my face every night, sending them (and the plastic packaging they came in) to landfill, not to mention wasting the energy used to make them. 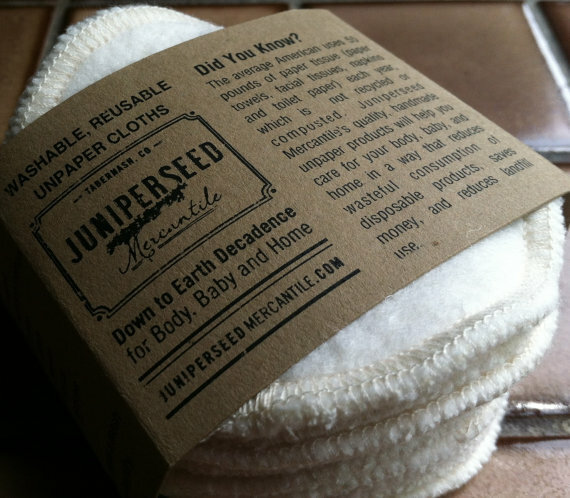 Juniperseed Mercantile sells earth-friendly products, such as makeup rounds made of hemp, bamboo, cotton, etc on Etsy (and packaged in paper!). They’re easy to clean, just put the dirty ones in the included mesh laundry bag and throw them in with a load of laundry. Disposable paper towels may seem like the easiest option for cleaning surfaces and helping with a mess, but buying the big package most come in takes up space in your house, which will eventually take up space in a landfill, and which costs you money each time you run out. 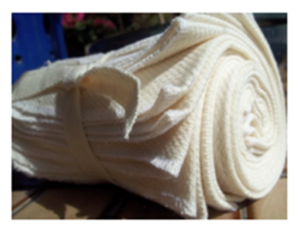 Cloth towels and napkins are a great alternative, and can be machine washed. Juniperseed Mercantile also sells “unpaper” towels here. I’ve really liked getting in the habit of using cloth because it can also serve as to wrap food using furoshiki, the Japanese style of wrapping cloth to transport things (instructions here; look at left-hand side of the page for more wrapping techniques). 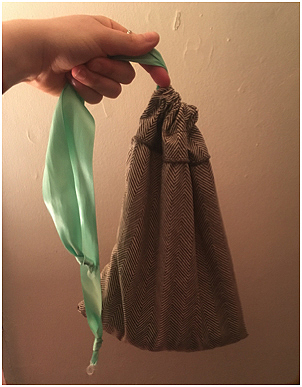 I recently went on a hike and wrapped my lunch of a sandwich, almonds, and an apple in a cloth with a furoshiki fold. Using just a cloth made my lunch pack very light, and I could use it as a napkin when I was eating, and again to wrap my apple core on the way back. Furoshiki is also a great way to wrap gifts. Note: paper towels (provided they are not bleached and were not used with chemicals like cleaning products) are compostable. While it’s better to compost them than to send them to landfill, the most sustainable option is to use reusable towels, which neither requires more trees to be cut nor continually uses energy to make. 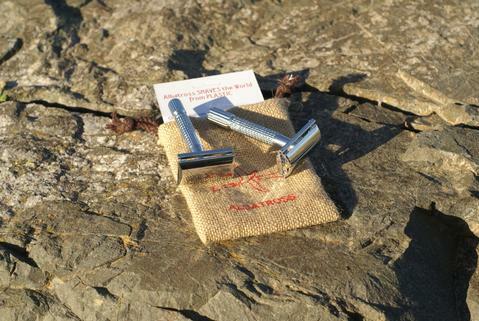 Switch out your disposable razor for a stainless steel safety razor with recyclable blades. Albatross Shaves is a great company to buy them new, but you can also find used ones on eBay and Craigslist (buying used is more sustainable as you’re not creating a new demand for products). Photo used with permission from Albatross Shaves. What is the Zero Waste alternative to cleaning your ears with Q-Tips? Not using them. They aren’t good for your ears, anyway–even the packaging states that you should not insert one inside your ear canal. A lot of health food stores have both in bulk. I actually prefer to use the same soap bar that I use for cleaning my body as shampoo (which you can buy package free in bulk sections of health food stores). Way before I knew about Zero Waste I started using apple cider vinegar (diluted with water so that the mixture was about 3:2 water to vinegar) in place of conditioner. Sometimes I’ll put a little coconut oil on the ends of my hair before my shower, and let it soak in for a few minutes, then wash my hair with soap and skip the vinegar in the shower. See if your bulk section has apple cider vinegar; if it doesn’t, try to buy the kind that comes in glass bottles so as to avoid plastic. It’s really easy to make your own. There are many different recipes out there if you’d like to experiment to figure out the taste you like best. 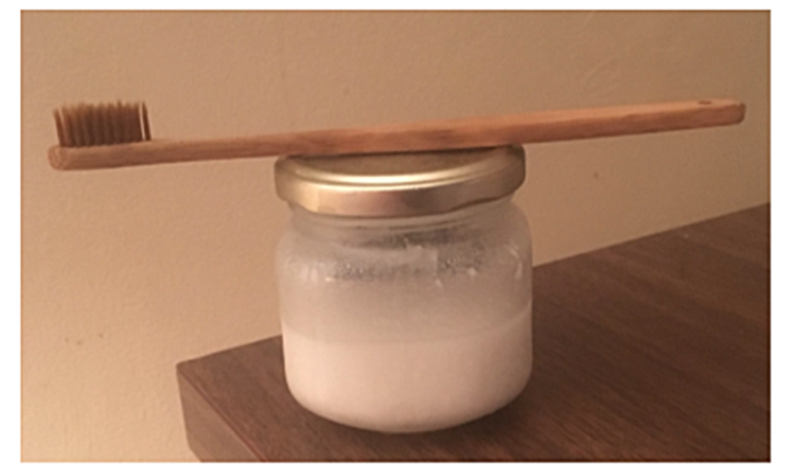 I followed the recipe Lauren Singer has on her blog, which uses 3 tablespoons coconut oil, 1 1/2 tablespoons baking soda, and 25-30 drops organic food grade peppermint essential oil mixed in a jar. Baking soda can be bought in bulk and coconut and essential oils can be bought in glass packaging (less optimal than bulk, but way better than plastic, especially since you can upcycle the glass as containers). I really prefer this taste to that of store-bought toothpaste, but the baking soda is pretty salty and can take some time to adjust to. Because you don’t want to throw out your old toothpaste, I suggest alternating your store-bought and homemade paste each time you brush. Baking soda has a reputation for being too abrasive, but research has shown that brushing improperly is the real culprit, and that baking soda actually has a lot of benefits, such as helping to remove stains from and whiten teeth (which means that if you usually buy teeth whitening products, you can save yourself that money and packaging), supporting a healthier oral pH, and lowering bad bug count. If you’re still concerned, you might want to discuss it with your dentist. These are just some alternatives you can make to live a more sustainable lifestyle. Remember that it takes time to go Zero Waste, it’s difficult to make the shift in a weekend, weeks, or even months. You don’t have to go completely Zero Waste to make a difference, it’s not an all or nothing thing. Don’t beat yourself up if you buy something packaged in plastic, the most important part is developing an awareness. Be patient with yourself and those around you, and make whatever steps you can when you can. Composting and recycling are essential in going Zero Waste. Neither require a lot of work on the consumer’s part, and yet when done correctly are so much better for the earth and its inhabitants (that includes you!). Paper bags are a great compost tool. If you have to drop your compost off at a designated location or are collecting compost on the go just collect your compost bits in a paper bag and drop the entire thing in compost. However, this does not mean you should always get paper bags when you go shopping, as you likely already have enough in your house to last you several months of composting. If you do run out of paper bags and want more for composting, you can get them from recycling centers or ask other people for some that they have around their own house so as not to make as big a demand for new products. Recycling can be confusing. You may be wondering what you can recycle, how you can recycle, and if recycling is the best option. Because it requires energy to convert items back into raw materials and then into new products, recycling is not completely optimal, which is why you should try to refuse, reduce, and reuse before you recycle. But avoiding recycling completely is very difficult in today’s modern world, especially when making the transition to living a Zero Waste lifestyle, and when material is actually recycled (for example, I am now buying Who Gives A Crap toilet paper made from recycled paper), the process does save more resources from being used. With so much recyclable waste out in the world, companies like Bureo are doing a great job of transforming material into longer lasting products. To help you navigate the recycling landscape, check out this post. Avoid plastic as much as possible, even if it is recyclable. There is not a big market for recycled plastic because it is often cheaper for companies to use raw material. 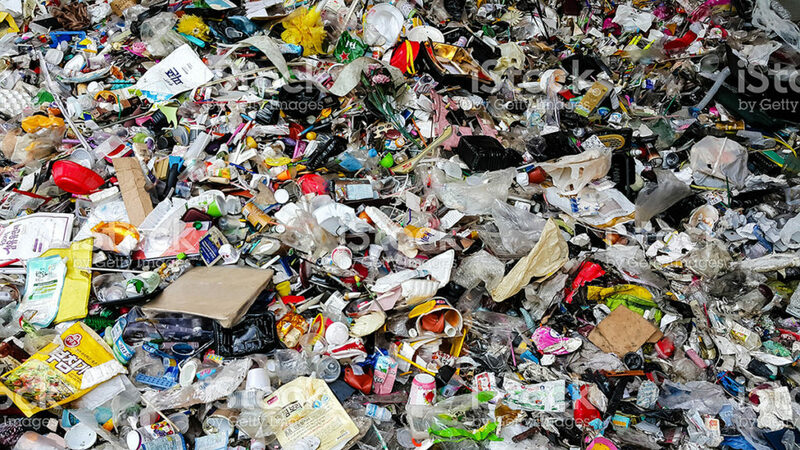 Plastic also harbors toxins, which contaminates both the product it contains and the earth through its manufacturing. A great zero waste step is to swap out any plastic cutting boards for wooden ones. This is especially important for your health because plastic is better than wood at cutting nicks in the board, which are great places for bacteria to harbor. You can’t recycle plastic cutting boards, whereas if a board is completely made of wood, you can compost it when you’re done with it. 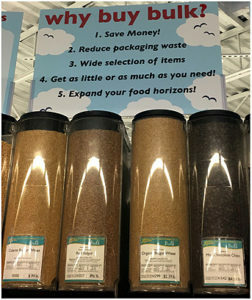 If you shop in bulk with reusable and non-plastic containers, use long-lasting compostable or recyclable products (bamboo, cotton, glass, etc), you will eliminate a substantial amount of your trash waste, create less clutter in your house (think of all those disposable plastic bags and tiny samples of products packaged in plastic that you may have grabbed because of the allure of free stuff), and make your space a peaceful, clean, and happier place for you to live in. 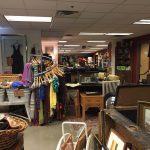 Some scenes from our local, favorite thrift shop in Brattleboro, Experienced Goods, which benefits Hospice. Clothes are a great product to reuse and recycle. I love buying second-hand clothes for a number of reasons. By buying material that is already in the waste stream, you avoid producing demand for new products that require a lot of resources and labor to make. Buying reused clothing will always be cheaper than buying brand-new clothing. Because I’m buying used clothing for less money, I’m more likely to wear it. I used to always keep my brand-new, more expensive clothes in my closet precisely because I had spent a lot of money for them, and I wanted to keep them in pristine condition. What’s the point of spending that money to have those clothes if I would never wear them? Clothes deserve to be worn and I deserve to get joy from wearing them, and when I know longer get joy from wearing them, someone else still deserves to, and it’s time to give them away. 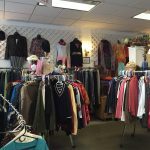 Take a look at this article here to learn about the basics of donating clothes.